WHAT IS A RUSSIAN WEDDING RING OR TRINITY RING? Russian wedding rings (also known as triple rolling rings, interlocking rings and trinity rings) are three individual rings that inseparably interlock one another and are worn as a single piece of jewellery. 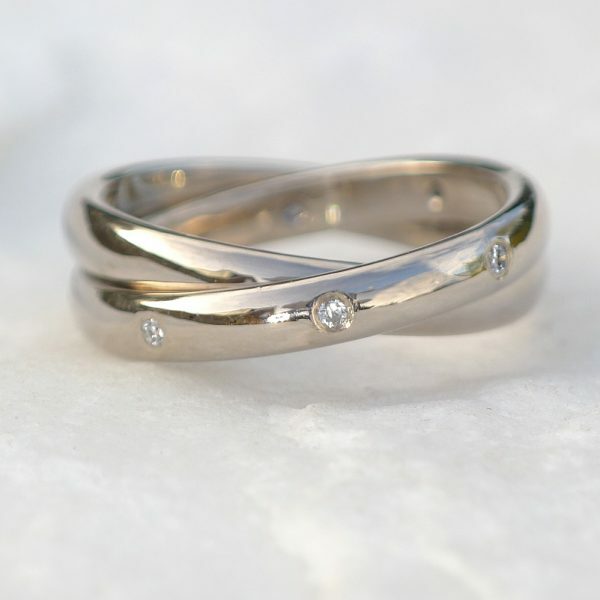 These alternative wedding rings can be made in silver, 18ct gold, rose gold, white gold and platinum, or using a mixture of metals to create a tricolour effect. There is an increasing trend for wearing a Russian wedding ring in place of a separate engagement ring, wedding ring and eternity ring. Diamond engagement rings and other gemstone rings can become damaged over time due the the elaborate and dainty settings, so many women choose to save their engagement ring for special occasions and wear a Russian wedding ring in its place as everyday jewellery. When a Russian wedding ring is worn as an everyday piece of jewellery, it's often called a rolling ring. They cna include more or less than 3 separate rings to create a different look, and they can also be studded with diamonds and gemstones or engraved, polished or hammered to provide detail. Trinity rings are usually worn on a different finger to Russian wedding rings to differentiate them from wedding bands. Their interesting style and contemporary, understated look make them perfect for everyday wear, and they complement a variety of other jewellery. Matching a trinity ring to your existing jewellery collection is as simple as choosing the precious metal and finish to match your existing pieces. You can add specific gemstones and engraving to further incorporate them into your existing jewellery looks. 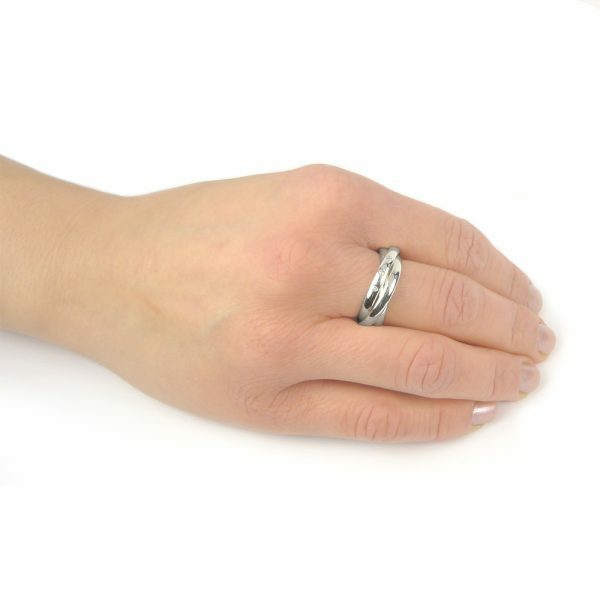 Lilia Nash Jewellery has a selection of trinity rings or Russian wedding rings available as made to order pieces, with occasional sizes in stock for same-day dispatch. All of these designs can be bought and paid for online. I offer the loan of a ring gauge if you are unsure about your ring size. All of my rings are available in UK sizes G - Z 1/2, with additional plus sizes offered by request. 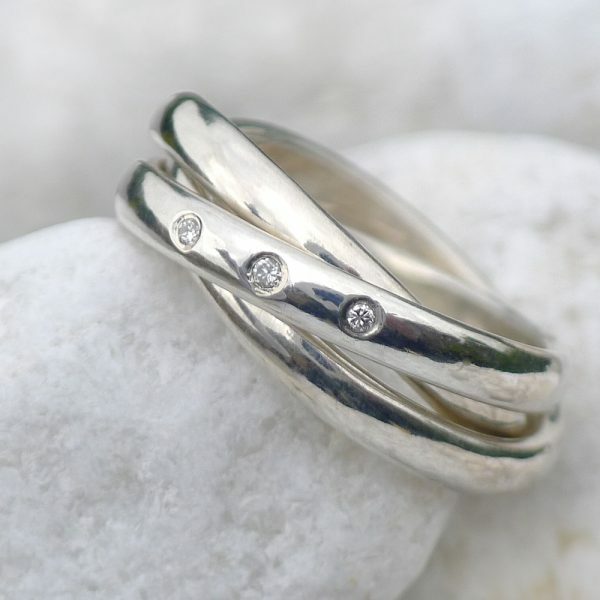 Bespoke orders can be by appointment in my jewellery studio in Lechlade, Gloucestershire, or entirely undertaken online. 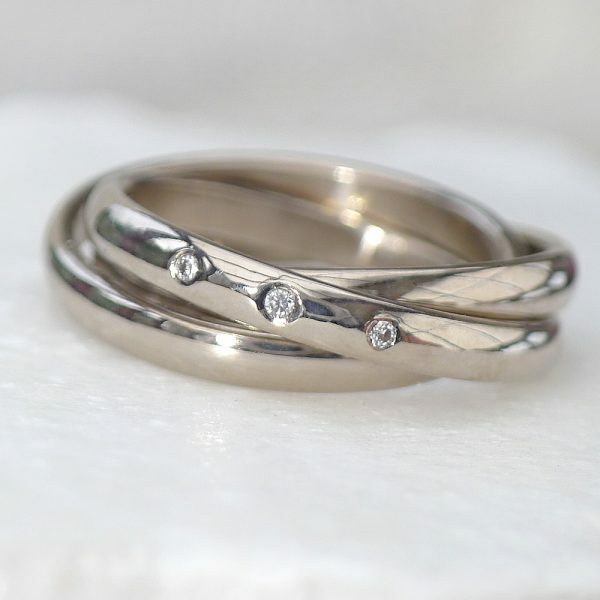 If you'd like to create a bespoke trinity ring, scroll down to get a quote for a personalised design. If you have ideas about how you want your ring to look but can't find the perfect trinity ring to buy online, I can help you make it a reality. To create a custom ring, I'll need some information as to how you want the design to look. You'll need to decide which metals you want to use, whether or not you want to add any details and of course, which size ring you'd like. 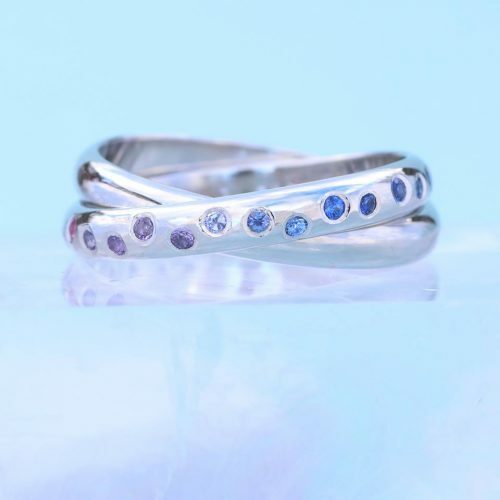 You can have a variety of ring profiles or widths, add diamond pave, gemstone settings, sapphires or other sparkling details. I can give the ring a hammered finish or give it another custom finish or polish to suit your tastes. All of my rings are handmade by me in my studio in the English Cotswolds, and will be hallmarked by the Birmingham Assay Office ahead of being sent. Rings are presented in a Lilia Nash jewellery box with an optional gift wrapping service. Rings are usually sent within 6 weeks of the jewellery completion date. If you want to pay for your order in instalments, please let me know. Ready to design your own ring? Fill out the below form with your ideas and Lilia will reply with a no-obligation quote for a bespoke Russian wedding ring, rolling ring or trinity ring.